Home survival supplies may not keep you in the lap of luxury after a disaster or even guarantee typical creature comforts. However, survival supplies will help to increase your ability to stay alive and remain safe in the face of disaster. In essence, you can help make the best out of a bad situation. Certain items always fly off the shelves before and during a disaster such as a blizzard or hurricane. Many survival supplies will be in limited supply, if not wiped out completely once a disaster is imminent or has already occurred. Beat the rush by stocking up on key survival items over time. Remember to label your items, organize them, familiarize your family with them and put them in a place where they can be accessed easily in case of a disaster. 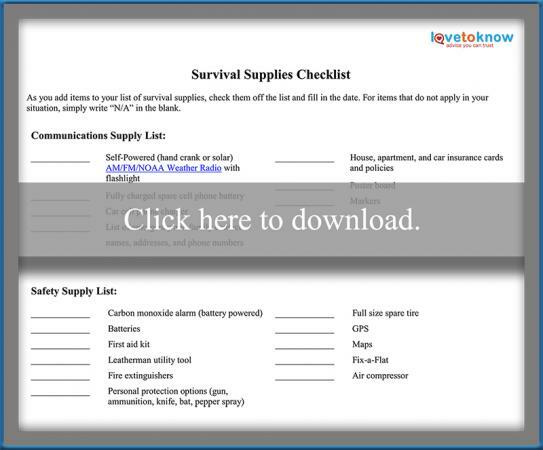 Click the image above if you'd like to download a printable shopping list of the survival supplies recommended here. How will you communicate or stay informed if phone lines, Internet, and television are down and cell phone towers are jammed? Do you even know your mom's or neighbors phone number by heart? Probably not, if you are like most people that rely on their smart phone contact list to keep track of numbers. The first step in communication is knowing what has happened and what is being done to make the situation better. According to the National Weather Service, the NOAA Weather Radio All Hazards (NWR) broadcasts continuous weather information "24 hours a day, 7 days a week". NWR broadcasts information for all types of hazards including natural events such as earthquakes and avalanches, environmental accidents such as chemical releases or oil spills, and public safety issues such as a child abduction or 911 telephone outage. Make sure you know how to access this broadcast before a disaster hits. Additionally, the supplies below will help to ensure that you have the vital information to keep connected to loved ones and make insurance claims. After disasters such as catastrophic earthquakes or terrorist incidents, keeping your family safe is a key element of survival planning. Be more prepared for the various threats that may present themselves after a disaster with the following supplies. In the event the power goes out, it gets dark fast - in fact, so dark that you may not be able to navigate stairs or avoid obstacles. Proper lighting helps you to stay safe from obstacles and be aware of unwelcome visitors, including people and animals. 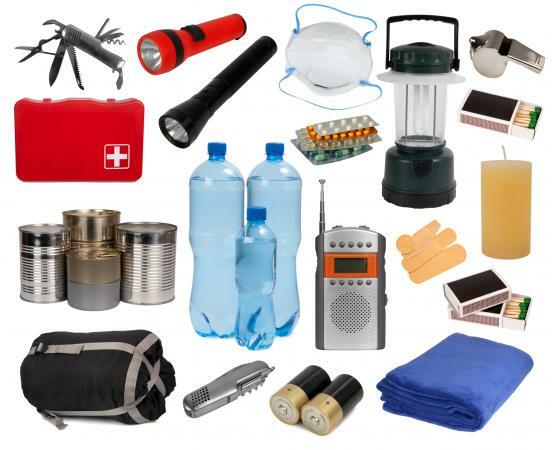 The items below will help you shine light in staying safe in a disaster. Staying warm in cold climates is a top priority. Hypothermia, a condition in which the body's core temperature drops below that required for normal metabolism and body functions, can set in fast. Conversely, extreme heat can cause hyperthermia, an elevated body temperature that occurs when a body produces or absorbs more heat than it dissipates. While generators offer a great benefit, generators must be properly maintained and used. Make sure you get a generator that is rated for the amount of power that you think you will need based on what you would like to continue to power after a power outage (e.g., refrigerator, stove, etc.). Failure to do so can lead to fire, electrical damage, severe injury, or death. After a disaster, you may be subject to long periods in the sun for prolonged periods of time. Further, disasters like hurricanes provide the perfect nesting ground for hungry mosquitos. Before you get a sunburn, bitten by mosquitos, or have rodents move in, think about how you can protect yourself by considering the following items for your survival supply cache. According to the Centers for Disease Control and Prevention, "good basic personal hygiene and hand washing are critical to help prevent the spread of illness and disease." Organic hygiene products are the best option for you and the environment. The list below offers insights on the hygiene considerations for the whole family. After a disaster, the likelihood of you needing your over-the-counter (OTC) or prescription medication increases, and proper planning is the only way you know it will be there when you need it. Work with your doctor and pharmacist to ensure you can secure an extra 30 day supply of regular prescription medications for each family member to include in your survival kit. The stress of a disaster can cause problems that you may typically not have dealt with before such as headaches and upset stomachs. OTC medications to relieve these kinds of symptoms are a great kit addition too. Also, don't forget that access to safe, clean water is critical. Keeping stress down to maintain health is also important. Try spiritual support, meditation, reading, and music to help relieve stress. Babies bring an abundance of joy and responsibility. That responsibility continues and even grows during and after a disaster. Keeping the right survival supplies on hand that reflect your baby's needs will help you to keep the baby healthy, properly fed, and as happy as possible. That is good for the whole family. After a disaster you may or may not be able to sleep in your own bed. For instance, after an earthquake there are aftershocks that may make it unsafe for you to remain in your home. This can create a stressful situation if not prepared because crowded shelters may become your only option. However, keeping survival supplies on hand like tents and blankets may allow you to remain close to home so that you can protect your property and remain relatively comfortable. If a disaster strikes your home, you will likely want to salvage belongings such as pictures and family heirlooms as well as attempt to save property. Often challenges such as collapsed roofs, downed tree limbs, and scattered building material present safety hazards to those starting cleanup efforts. Safety should be taken very seriously. Hazards such as downed power lines present a very real and deadly danger. The list below is presented for the purpose of basic clean up in a safe environment only. Putting together a personal survival supply cache can help you and your family stay informed, remain self-reliant, stay connected, and, most importantly, remain safe. Self-reliance empowers you to protect your family, manage the environmental factors such as cold and heat, and stay informed of disaster response operations. Survival supplies will offer you peace of mind to know that you are prepared should a disaster strike locally. When faced with disaster, your ability to adapt and be self-reliant is the greatest variable that will directly affect your ability to keep you and your family safe.